ADD PENGUINS TO YOUR ADVENTURE! Meet the Aquarium’s most adorable creatures Face-to-Beak! Interact with one of the playful penguins from the state-of-the-art indoor/outdoor habitat! *Remember the interaction is with a live animal and therefore dependent on the nature and well being of the birds. See the Aquarium’s Most Adorable Creatures Paint! Would you like to see one of our African Penguin artists in action? 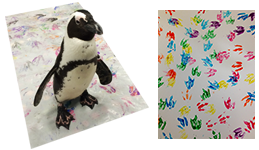 Join us in our Penguin Painting Experience and take home a one-of-a-kind piece of art that you helped create! Take home an 8X10 Penguin Painting you helped create! Up close to one of our penguins while it creates its signature footprints on canvas. *Canvas size upgrades available for an additional charge, based on availability. *Remember, the interaction is with a live animal and therefore dependent on the nature and well being of the birds. Create your own All-In-One Aquarium Experience Day and SAVE!